Classic music aficionados will have the rare chance to indulge with a unique Ludwig van Beethoven program-only this Sunday, Nov. 18 at the Orpheum Theatre. 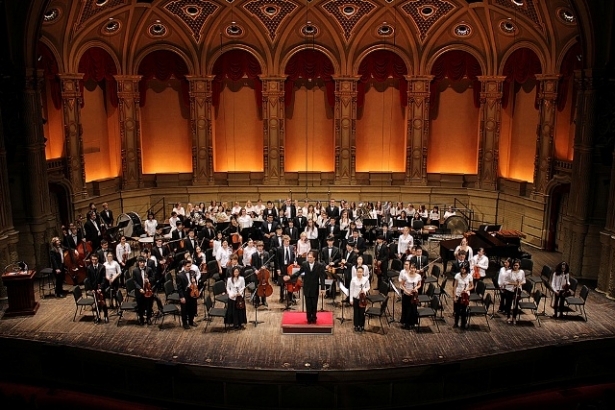 The Vancouver Academy of Music Symphony Orchestra (VAM SO) will perform a full-fledged "Beethoven Celebration" opening with the Fidelio Overture followed by the Triple Concerto for piano, cello and violin. In the second half, the orchestra will perform one of the magnum opus in classical music, the 9th Symphony featuring four soloists from the Vancouver Opera and the Vancouver Bach Choir. This is one of their most ambitious projects to date. The choice to play all these Beethoven's works together was a rare opportunity made possible in part by VAM’s music director and conductor, Leslie Dala, and his close connections with both the Vancouver Opera and the Vancouver Bach Choir -- he also works in both organizations filling in the responsibilities in music direction and conducting. “Joseph Elworthy, the executive director of the Academy [of Music], and I were talking about doing a big project for this concert” and I suggested, ‘Why don't we look at doing the 9th symphony of Beethoven and I can get the [vocal] soloists and the Choir?,” Dala said in a phone interview. Dala, who joined the VAM last year, was also enticed for the diversity on stage given that it involves " two different art groups and musicians", for which he feels “very excited and happy” as they have been able to put this together successfully. The performance is also a multi-generational musical affair: the VAM SO's ages range from 12-year-old-to graduating students in their 20's. The soloists from the Vancouver Opera Young Artist Program are also in their 20’s, while the Vancouver Bach Choir includes singers of earlier vintage who had been members for a long time. Another highlight from the concerto this Sunday is the anticipated homecoming of the special guests, VAM alumni : pianist Naomi Woo, violinist Jonathan Lo and cellist Jonathan Chan,who had played together as a trio, continue their studies in prestigious music schools abroad: Yale University, Juillard and Guildhall, respectively. These talented musicians will be reunited to take the stage with the 110 students from VAM SO to perform Beethoven’s Triple Concerto for the first time, along with the soloists from the Vancouver Opera and the Bach Choir. Tickets are $10 for adults and $ 6 for students and seniors. The concert starts at 7:30 p.m.